The Lion Dancers of the Jing Ying Institute of Annapolis draw a large crowd as they perform at Asian Spring: A New Year Celebration at the Francis Scott Key Mall on Saturday afternoon. FREDERICK -- The rhythmic pulse of kettle drums echoed through Francis Scott Key Mall on Saturday afternoon as two ornate Chinese lions bobbed and weaved through the crowd at center court. Two adults from Jing Ying Institute of Annapolis shrouded themselves in a red silken drape, their legs becoming those of the lion. A smaller, green lion controlled by two children twisted and swayed nearby. When the drum's cadence burst into a frantic tempo, the larger lion lurched and engulfed a red plume held at the end of a 10-foot pole, drawing laughter and applause from the audience. Eyes blinking and mouth flapping, the lions fended off evil spirits and brought good luck to more than 100 spectators as part of a festival celebrating the beginning of the Lunar New Year, which starts Feb. 18. The exact date changes each year. Many cultures in Asia celebrate the first new moon of the new year as the traditional beginning of the year. 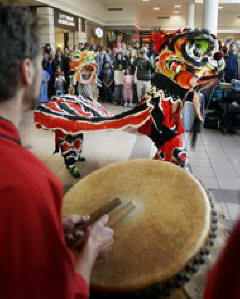 While the dancing lions expressed the Chinese tradition, other Asian cultures also celebrated at the mall. Rajiv Paul, vice president of the Indian Association of Frederick, thinks festivals, public service and education will help bring awareness to the positive impact people from India, Pakistan, China and other Asian countries have on Frederick County. "We don't want to see divisions, we want to become part of the fabric of the community in Frederick," he said. "To bring awareness to our diversity is the most important thing we can do to spread our culture." Paul said sharing cultural experiences with people who are not from Asia is key to gaining acceptance. He thinks assimilation is not about giving up one's cultural identity, but combining different ways of thinking to develop a new way of life. The goal is to create a philosophy that fuses cultures. "In order to be effective, you need to identify with each other ethnically," he said. "The melting pot melts together once you understand what the community is about -- that's what makes the melting pot work." Elizabeth Chung, spokeswoman for Frederick-based cultural education group Learning Institute For Enrichment and Discovery, agrees. She thinks the most important asset each ethnic group has is cultural heritage. She hopes festivals like the one Saturday will show Frederick residents Asian cultures are diverse, but united. Chinese culture and history inspired Frederick native Chris Wilson, 32, to start studying kung fu more than a decade ago. Wilson brought his wife, mother and daughters Bailey, 9, and Cailin, 7, to enjoy the festival. "For me, it wasn't really the defense part of kung fu that drew me," he said. "It was more the animal style and how they came along and were influenced by history." His fascination with kung fu -- which has several styles influenced by animal movements -- and Chinese culture led to an eight-year pursuit of colorful body illustrations featuring a character from Chinese literature, the Monkey King. Swirls of pigment create a panorama of traditional kung fu scenes that wrap around Wilson's right forearm, and reach to the top of his shoulder. On the inside of his forearm, a monkey drinks from a jug, depicting the drunken monkey style. Near his elbow, a monkey raises his arms to mimic the movement of a snake striking. Eric Brooks from Classic Electric Tattoo on Market Street drew the scene. "The documented history really astonishes me, they can trace foods back to 3,000 years ago and leaders back to 5,000 years ago," he said. "It's just great that I can share this with my family and it shows diversity in Frederick -- they didn't have this 10 years ago."